Sorry if you have been coming back for updates. 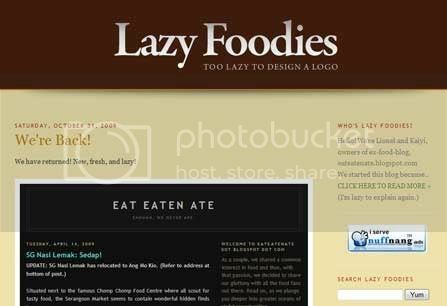 We're officially forsaking eateatenate for a brand new food blog at http://www.lazyfoodies.com, where things are kept simpler, which means more updates! 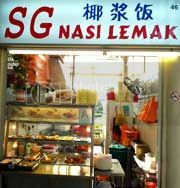 Situated next to the famous Chomp Chomp Food Centre where all scout for tasty food, the Serangoon Market seems to contain wonderful hidden finds too. 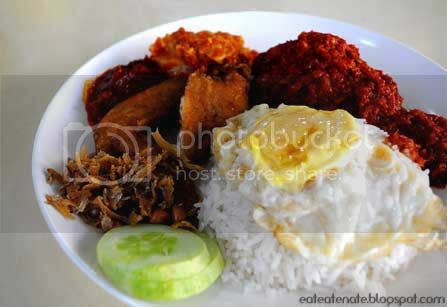 A humble-looking Nasi Lemak stall at the corner caught our eye as we see a queue forming as early as 6pm. The spotlight of Ayam Merah (their signature dish) is the chicken. It had been deep fried then further cooked together with their special homemade gravy which complemented perfectly. Despite being cooked twice, the chicken remained tender, and even eating the gravy by itself is an indulgence - the sweetness is excellent and the spiciness level totally flatters our local taste. As for the rice, we do find the coconut flavour slightly bland. Overall, price is reasonable and portion is great. Do give it a try. 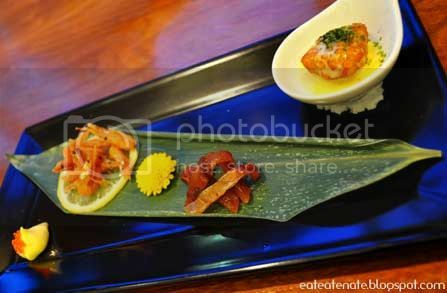 Tue - Sun: 7 a.m. - 8.30 p.m.
We were given the opportunity to review Tetsu's new menu and it had been rewarding. 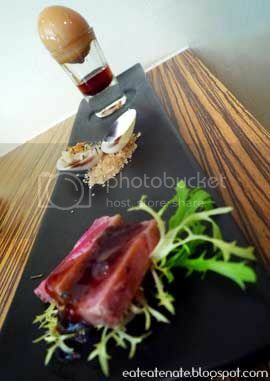 The new menu consists of much more deliciously and meticulously prepared food which never fail to entice our taste buds. The Kawa Ebi Karaage on the extreme left are deep fried river shrimps, and because they are so small, you can pop in several of them and feel the satisfying crunch between your teeth. Next to the shrimps are strips of Fugu Mirin Boshi (dried puffer fish) - a rare delicacy which can be deadly if not prepared properly. Being our first time trying "poisonous" food, we had all sorts of questions running through our minds. I got surprised on my first bite when the puffer fish turned out to be sweet and chewy (but not puffy like what I imagined). 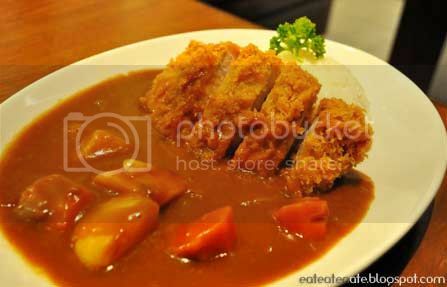 Lionel commented that its texture slightly resembled our local favourite 'Bak Kwa'. This piece of prime beef tenderloin is in good hands! Hand-grilled to perfection, we fell in love with the soft tenderness and succulence of the meat instantly. 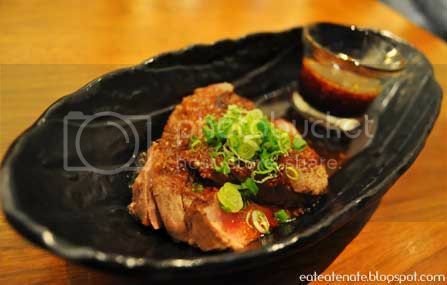 Plus, something different about grilled tenderloin in Western cuisine and Japanese cuisine is the sauce, and this one here matched wholly. A well-breaded fried fish (behind) is added to the Kushi-Age family, and with every bite you could feel the crisp of the skin, while the flavour, softness and moisture of the fish fillet retains. 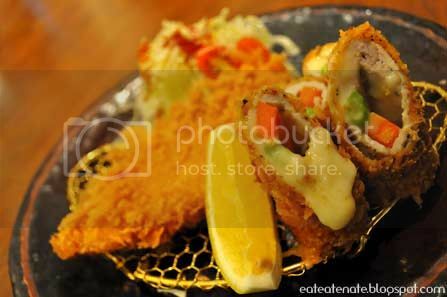 Also in the Kushi-Age family, the Katsu had evolved into cheesy rolls (in front)! The peppery taste of the breaded pork makes it a good contrast against the sweetness of the carrots and asparagus, and the melted cheese just adds more kick although I would personally prefer even more cheese. Make sure you eat this dish fast before the cheese turns cold and hardens. 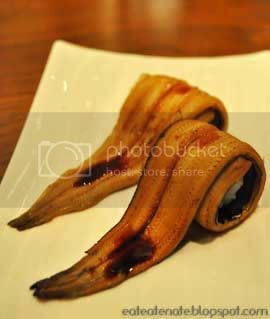 Take a break from all the strong flavours with these freshwater eel sushis - light with a dash of natural sweetness. 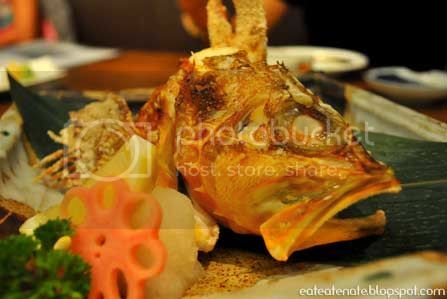 An expensive air-flown premium red snapper head, undeniably fresh but I find the meat a little too tough and salty for my liking. Perhaps it was the method of cooking. Unlike other Japanese curries that are often powdery and too sweet, this smooth curry (a special recipe by Tetsu) is fragrant yet not overpowering, and it simply slides down your throat and warms you from within. Oishii! We were in for a surprise personally prepared by Chef Kent, and it was AMAZINGLY AWESOME! Radish was painstakingly hand crafted into a shape of a Ohitu (some Japanese rice bucket which looks like this), and inside, it was filled with salmon roe and more radish, ALL exaggerating fresh and luscious. We've never had anything like that before! Greatest thanks to Chef Kent (but a pity the dish is not on sale). 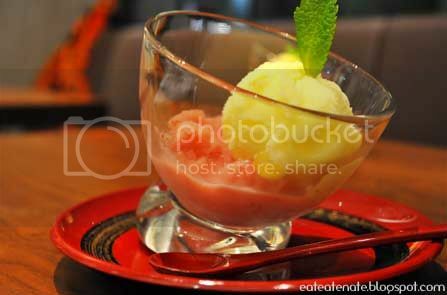 Yuzu (pomelo), strawberry, lemon, tangerine, grapefruit and pine - a myriad of tastes packed into this unique Japanese ice cream. Savouring the end products after months of hard work and intense preparation from the Tetsu's chefs brought back memories when we first tried Tetsu. There is an apparent improvement, and the new menu definitely brings about more variety and excitement to the customers. Mon - Sun: 11.30 a.m. - 10 p.m.
Having tried the 6-course set lunch at Tao's a year+ ago, we're now hopping over to its next-door neighbour, JuJu, for their 6-course hot pot lunch. Both restaurants are managed under the same company, and located at the same mall - PoMo Centre, formerly known as Paradiz Centre. The new name sounds kinda funny though. The elongated plate came with some beef and shellfish which I can't really remember, but the main spotlight was the Golden Egg. 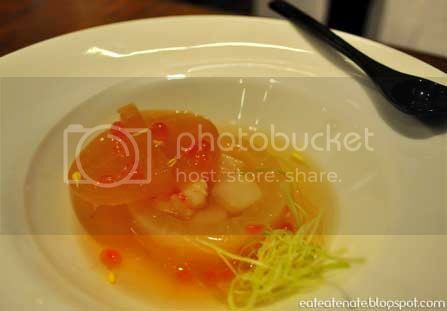 Semi-boiled to 70% and when mixed with their own special sweet sauce, it was HEAVENLY I tell you! Never in my life I knew something so common (eggs) could taste so uncommon. The Vermicelli was the usual kind, and it was there just to fill you up. 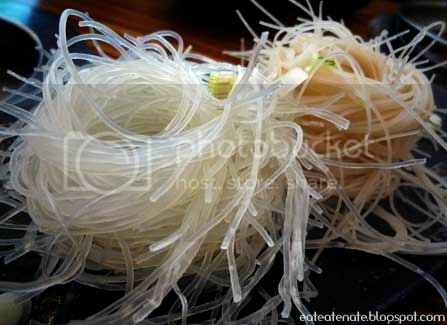 Other side dish choices include White Rice, Rice Stick, and Soba. 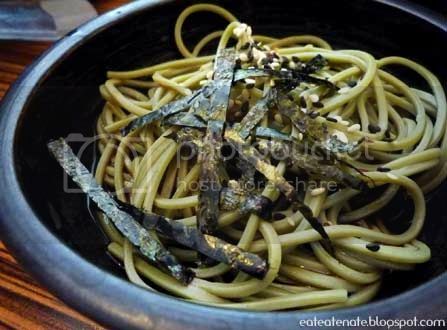 Their Soba was a bit below standard - more on the hard side. Looking at the menu now, the lunch set actually includes a Dumpling Platter but I realised I don't have any pictures. Either we forgot (to take photos), or the restaurant forgot (to serve), or the dumplings tasted so mediocre that we had forgotten (whether even we ate them in the first place). Okay I just saw the dumplings hiding in the main platter itself, and they must have really tasted mediocre because I don't recall their existence at all! 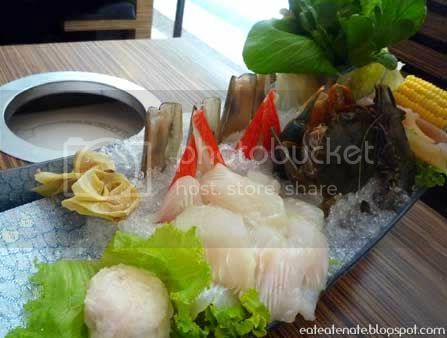 The Fresh Pacific Ocean Platter seemed the most intriguing and worthy set, with different types of seafood sitting in a large wooden boat. The seafood are basically some prawns, mussels, fish slices, crab sticks, a whole crab etc; and the crux to great seafood lies in their freshness, and JuJu did it. Chicken and Pork Combo was nothing unusual with brinjals, yam, lotus roots, carrots, plus other vegetables. 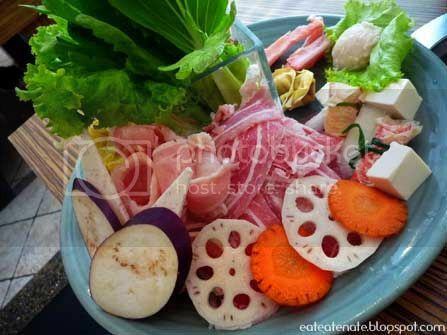 Meat were also fresh and thinly sliced (perfect for steamboats), but personally, we prefer the pork to chicken. 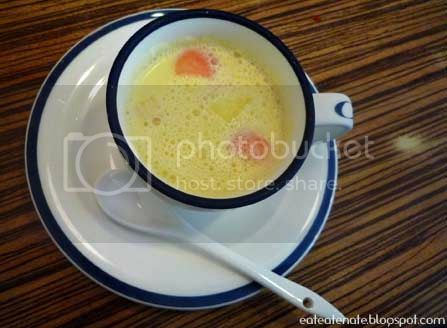 The restaurant offers individual hot pots, and also individual soup bases - JuJu’s Hokkaido "Kun Bo" Clear Soup, Hot and Spicy Soup, and Creamy "Kun Bo" Soup. 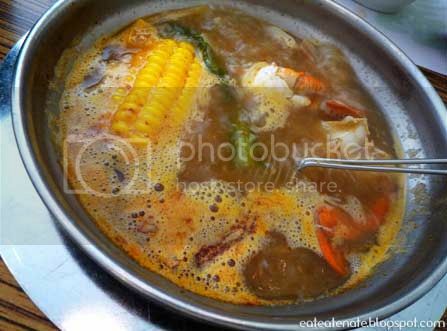 We chose the first two, and both of us find the Hot and Spicy Soup too overpowering that it masked out the natural taste of all the steamboat ingredients. The attentive waitress noticed the changes in our faces and offered to pour in some "Kun Bo" Clear Soup to neutralise the spicyness, and it did help a little. According to the waitress, these Ice Plum Vinegar were supposed to aid in digestion, and indeed, it felt really soothing after a heavy meal. There wasn't much variety in the desserts, so we left our decisions to the friendly service crew. 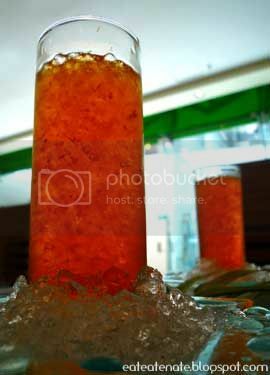 Pearl Habor was similar to what we know of, the Honeydew Sago. Not bad, pretty refreshing. 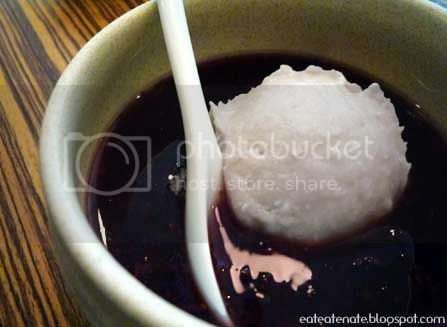 This was similar to our usual Hei Nuo Mi (Black Glutinous Rice Dessert) but I don't like the Glutinous Rice desserts, so nope, this wasn't for me. We were initially attracted to the idea of having individual hot pots, and little did we know, steamboats can be comfortable too. However, the price jump from lunch to dinner didn't seemed quite worthwhile because the difference only lies in the kinds of dumplings being served. And as expected, JuJu's service was a big plus! So Much Food, So Little Space and Time! Copyright 2007-2009 © http://eateatenate.blogspot.com. All rights reserved.